Did you know that thanks to modern technology, MYOB Training online has never been easier? You can experience all the benefits of having an experienced and professional MYOB Trainer sitting right there with you, at your computer, without them actually ‘being there’ – even without the cost of phone calls. You can hear the trainer’s voice speaking to you – the trainer can see your computer screen (or he can give you access to his screen) and watch every move you make while giving you instructions as they guide you through the training process. You can ask any question you like, as you would do in a one-on-one exclusive training session. The only thing you can’t do is reach out and touch them . . . not that you’d want to! If you’re looking for the most effective learning process, then MYOB training online could well be your best option. Why? Because there is no better way to learn than when YOU are in the driver’s seat. Have you ever been to a training session of any kind, where the trainer stands at the front of the class and shows the group a heap of Powerpoint slides and explains everything in great detail, but you go away not much the wiser – because YOU haven’t had any “hands on” practical experience with what the trainer was talking about. There is no better way to learn something than when YOU do it. If you have a computer that is connected to the internet, you can download a free program called Team Viewer. Just click this link to open the installation page in a new tab or window – or if you have a Mac, then click here. Team Viewer allows another person to look at your computer screen from a remote location. It is very secure and each session includes a unique user name and password – so it’s not like they can come back later and take a look around when you’re not there. It’s very easy to instal and you’ll also find it handy for other things later. You will need to have this free program installed before we can start the online training. Call or text msg us on 0435 990 480 or email us anytime and arrange an agreed time for your training. 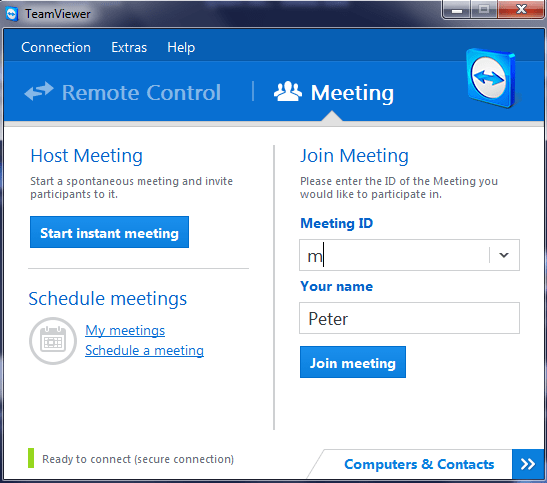 We then phone you at the agreed time and invite you to start your training session via a Team Viewer “Meeting”. 3. We’ll talk with you on the phone (have some ear plugs handy) or on Skype if you prefer, while sharing computer screens – it’s that easy! During the myob training online session, we watch your computer screen (or you watch ours) and can see everything you’re doing. We talk with you and personally tutor you, showing you exactly what to do and when necessary, can “take over” for you at our end. The important thing is this: YOU DRIVE – it’s the best way to learn MYOB. An online training session typically takes up to 3 hours maximum. Because of the convenience of online training, this can be broken up into smaller segments if your prefer. After 3 hours personal tutoring, you will have a good understanding of all the basics you need to get the most from your MYOB program. It’s much more effective than a classroom environment. Your training is charged at an hourly rate – no other hidden fees or complicated plans. $65 per hour is very reasonable. More advanced assignments that make the most out of your MYOB accounting program using Job & Project Tracking, Categories, Recurring Transactions, Database Integration, User Control and the like. Anything you like – whatever you need – you set the parameters of the training. And if one of your main concerns is, that once your MYOB training online is over, you’ll be feeling overwhelmed and “on your own” – don’t worry about it! You can email us again anytime as often as you need, for those little things you just didn’t quite “get” during training and we’ll talk you through it. If the issue takes less than 10 minutes to resolve – it’s free! Once your MYOB training online session is complete, we will invoice you, or your sponsor, with an Acrobat .pdf file by email (you can use this to claim a tax deduction if it’s connected with earning your income) and you can simply pay us by either visiting our website and using the PayPal button, or if you have internet banking, transfer the funds to our account online. So easy! So call us today on 0435 990 480 – or Email Us to explore your training possibilities and we’ll get back to you the same day. Don’t wait until you’re in a fix. We are here to help you. Oh! And did I mention? Followup assistance via email is FREE for 60 days after training.